Steinfest Video Slot Review - Casino Answers! Steinfest is a 5-reel, 9-line video slot developed by Microgaming, featuring stacked wild symbols, scatter wins, multipliers, a free spins feature and a bonus game. You can play the Steinfest video slot at Bovada. Coin values on the Steinfest slot machine are $0.01, $0.02, $0.05, $0.10, $0.20 and $0.25. You can select up to 9 paylines at up to 10 coins per line on a spin on the Steinfest video slot. You can bet as little as one cent on the Steinfest penny slot game up to the maximum total bet of $22.50. Steinfest has a low betting range that is best suited for casual players. You can manually skill stop the reels by pressing the “Stop” button at any time during a spin. 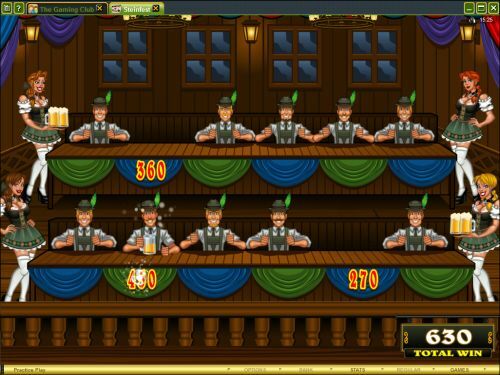 To play the Steinfest online slot game, select your bet and press the “Spin” button. To play all 9 lines at 10 coins per line, you can also use the “Bet Max” button to spin the reels. The Girl with Steins and Girl with Mugs symbols are the two top paying symbols on the Steinfest video slot. If you land 5 of a Kind of either one of these symbols, you will win the 2000 coin top jackpot. If you land 5 of any combination of the two symbols, you can win a 1000 coin mixed payout as well. The wild symbol on the Steinfest online slot is the Steinfest symbol. It will substitute for all symbols except for the scatter and bonus symbols. It appears stacked, so it can appear in up to all three positions on a reel. During the free spins feature, stacked wilds are doubled stacked, meaning that more wild symbols appear on the reels, making it more likely for you to land three wild symbols on a reel. The Sign is a scatter symbol on the Steinfest slot game. Two or more Scattered Signs will award a scatter payout. You can win up to 50X your total bet by having five Scattered Sign symbols appear on the reels. If you land three or more Scattered Sign symbols on the reels, you will win 10 free spins at a 2X multiplier. All wins are doubled during the free spins feature. The free spins feature can be re-triggered. All bets and lines played are the same as the spin that triggered the free spins feature. You can win free cash by triggering the free spins feature on Steinfest at Bovada! All wins are multiplied by the bet per line, except for scatters. Scatter wins are multiplied by the total bet and added to payline wins. All wins pay left to right only, except for scatter wins (which pay any). Only the highest win is paid per selected payline. To use the autoplay mode on the Steinfest online slot machine, you must hit the “Expert” button. You can now play 5 or 10 autoplay spins. For advanced settings, hit the “AutoPlay” button and you can now play 5, 10, 25, 50, 100, 250 or 500 autoplay spins and stop autoplay if a win exceeds or equals $100, $500, $1000, $5000 or $9999. Autoplay will stop on any feature contained in the game. You can stop autoplay at any time. They don’t make as many new 9-line video slots anymore, but Steinfest makes up for the lack of new options. Steinfest offers one of the best bonus games we have seen in a long time as well as a free spins feature. You can play the Steinfest video slot when you sign up and make a deposit at one of many Microgaming online casinos, including Bovada. Can players from the USA play the Steinfest video slot for real money? 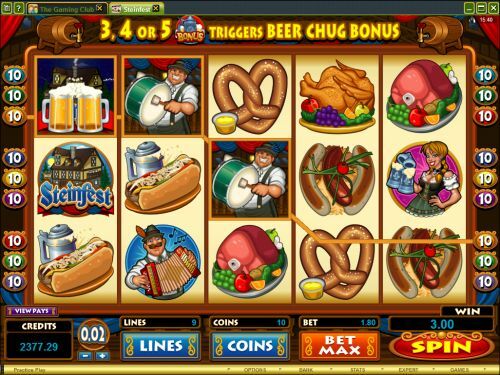 Unfortunately, players from the United States of America cannot enjoy the Steinfest video slot at Microgaming casinos. However, you can read our Roll Out the Barrels Video Slot Review for a similar video slot or you can play it at a Rival online casino such as Bovada.